← I’ve Got the FehVah! Friday 2 July 2010: 3 years 10 months on . . .
We had all been waiting for this day! 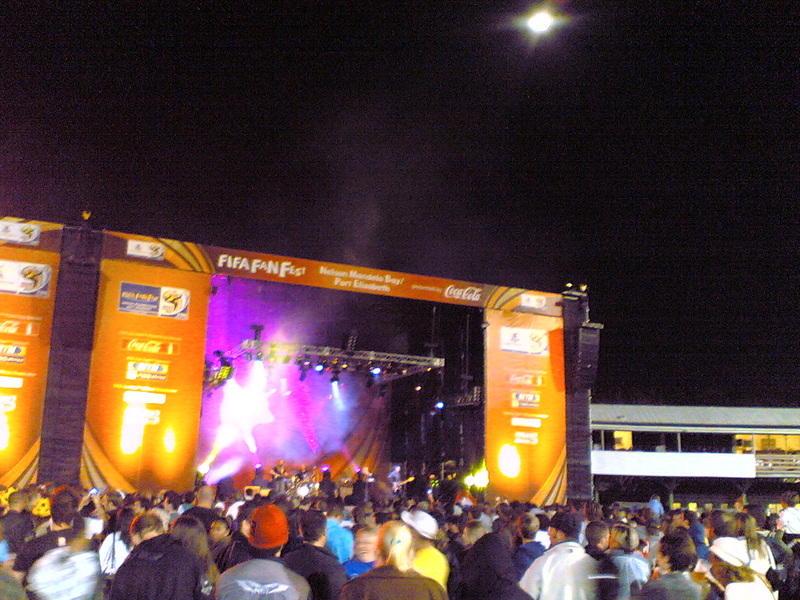 Tuesday 22 June 2010. Bafana Bafana were taking on the might of France in a do-or-die encounter in the FIFA 2010 World Cup ™. From the hype that preceded the day, it appeared that the entire future of our nation depended squarely on the outcome of this game. It was touted as the Battle of Bloemfontein! So, at 15h00, together with 10 000 other fans, Sean, Phillip and I headed off to the St George’s Fan Park™. I was not feeling well but was definitely not going to miss out on this encounter. We needed to beat France and to beat them comprehensively by 4 or 5 goals in order to stay in the competition. It was a tall order. But, the crowd erupted time and time again as The Boys kept the goals and the near-goals coming. 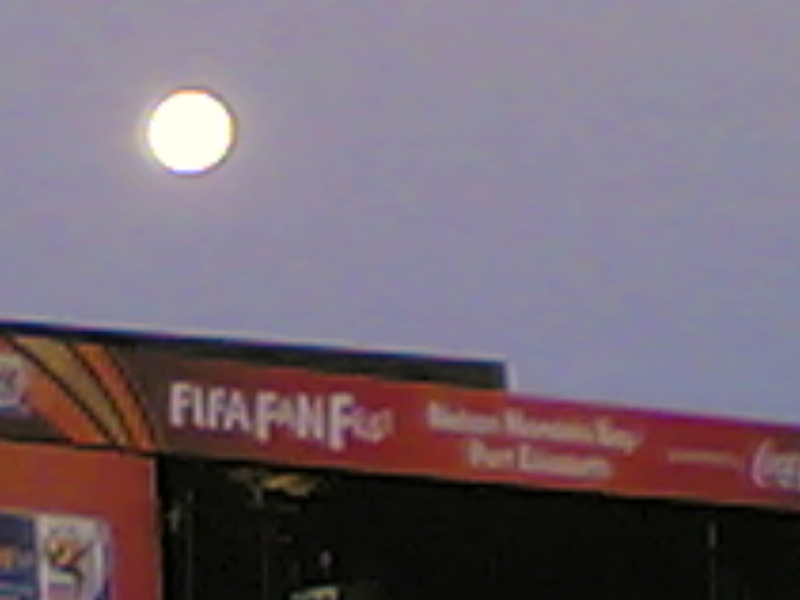 As darkness fell, the almost full moon came up over the largest TV screen in the country. For a moment there, God, I thought I was looking at You directly in the Face. And I asked you “God, please let us win this one. You know how much our country needs this win!” But, as so often in life, You appeared not to hear or to have some other ideas about this. In the end, we won the skirmish, lost the battle and won the war. Yes, we beat France by 2 –1, but did not do enough to remain in the competition’s next round of the 16 top teams. However, in the grand scheme of World Cups, and as I have written before (see Oh What a Circus Oh What a Show), despite not winning the tournament, our country has emerged as the winner simply by hosting this Show in such a successful manner. It has transformed our nation. This Show has reminded me so much about Life. Sean and Phillip had long since left me to join up with their mates. And so, despite being surrounded by 10 000 excited people, I was there alone and not feeling well. And, like so many people in this world, when the hype was at its highest, I was actually feeling down and lonely and scared as I pondered life. In the hype of life, let us never forget those amongst us who are alone and who feel lonely. I spoke to You, the Man in the Moon, as You smiled down at us. I think You also created World Cups for Your people and You saw that it was good. This Show and Life have so much in common. There is the euphoria when we announce the arrival to the world. There is the preparation and the infrastructure required. The hard work and the sleepless nights follow. Along the way, there are the highlights and the lowlights; the ups and the downs; the victories and the losses. There is happiness and sadness and tears and laughs. We win some and we lose some. And, sometimes, things appear not to be fair. Sometimes, they are just NOT fair. Sometimes, winning at all costs is so important that the rules are flouted. Sometimes, the cheaters win. But all the time, everything is under control. And, when things get tough and tight, like the penalty shoot outs tonight, then, God, we raise our hands to Heaven and to You, and ask for Your help! Some get to stay to the very end. Some get extra time. Some get injured and some get through relatively unscathed. Some are sent off early. Some of us get red-carded along the way and we can take no more part in the show. We get sidelined. And we don’t always understand . . . and we ask why. There are answers sometimes and sometimes there are not. We have to accept the Referee’s decision. And it’s OK to cry when we hurt ! Even big well-built men who seemingly have the world at their feet cry, and on international television nogal! The players cry, the coaches cry, we cry! Who said that cowboys don’t cry? And, as we are told in the press today that the Port Elizabeth’s Boet Erasmus Stadium will close down permanently tomorrow, we are reminded that nothing in this life continues indefinitely – not the Boet, not the World Cup Show, not Life itself. Only You remain the same – yesterday, today and forever. And You remain the Winner! And, when it comes to an end, will it be remembered? Did it truly make a difference? What is left behind? What legacy is left? Is it a better place? Ironically, today, exactly 46 years ago, on 2 July 1964, US President Lyndon Johnson signed the US Civil Rights Bill, which prohibited racial discrimination in the United States of America. I dream that I will wake up in a body that works. I dream of the Life to come. 6 And he said unto me, It is done. I am Alpha and Omega, the beginning and the end. I will give unto him that is at thirst of the fountain of the water of life freely. May all your penalties and offences be overlooked. May you never go offside. May evil never tackle you. May your life go into extra time. And may you win the trophy of Heaven in the final. Read the script and listen to the audio …. Thanks for sharing my dream!